Murtabak or Mutabbaq (Arabic: مطبق) is a dish which is commonly found in Saudi Arabia (especially the Hejaz region), Yemen, Indonesia, Malaysia,Singapore, and Brunei. Depending on the location, the name and ingredients can significantly vary. The name mutabbaq (or sometimes mutabbag) in Arabic means “folded”. I went a little mad in the kitchen last week, not in a knife wielding ala Psycho kind of way, but in a channeling a South East Asian Martha Stewart in the kitchen kind of way. Blame it on being home sick, but I had been craving Indonesian dishes like mad in the past few weeks. I haven’t really bothered to hunt Indonesian restaurants in London as the likelihood of being disappointed would be too shattering. In a rather odd coincidence I managed to spot Sri Owen’s new cook book, titled appropriately enough Sri Owen’s Indonesian Cookbook sitting pretty on a shelf at Waterstone. Y mentioned this a while back and I couldn’t resist to pick it up and glance through it. Having purchased it, it was difficult not to use it and as Indonesian dishes were meant to be shared I rounded up a group of enthusiatic guests to trial the recipes out. The menu from that night included Martabak, Bebek betutu, Gado gado and grilled John Dory. I nearly added another dish, but I think I would have killed most of my guests at this stage with overeating. 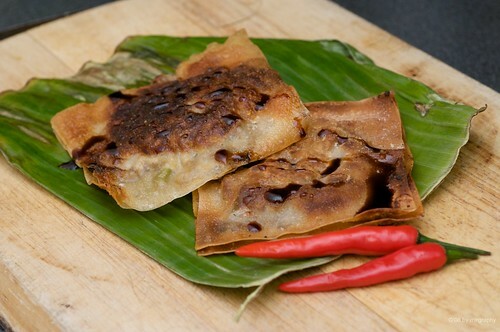 The first dish featured in this post was Martabak, a street snack that was quite difficult to replicate. The version I made was the savoury version usually called Martabak Telur or egg Martabak. The outer layer was traditionally made from a very thin crepe like egg batter that was fried quickly, before the batter cooked completely it was filled with minced meat and spring onion before being folded. The cheat’s version used fried wonton as its skin and was a surprisingly good alternative. 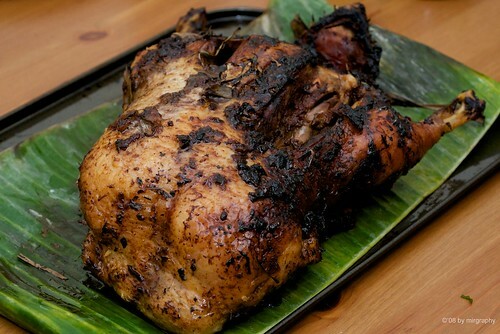 Bebek bertutu translated into grilled duck marinaded with a chilli paste, stuffed with chilli rubbed spinach, covered with banana leaves and then baked over 3 hours. Gado Gado was a salad with peanut dressing, I forgot to take photos of this eventhough I made the sauce from scratch (sigh). 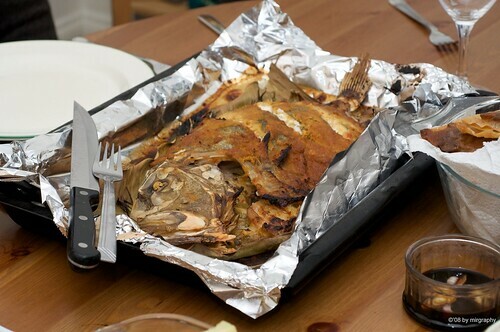 As for the grilled John Dory, it was sealed with a coconut chilli dressing before being slowly cooked in the oven. A more traditional fish would be gourami, but the closest substitute for a similar flat type fish is the John Dory. Despite turning the kitchen into a bomb site and burning a tea towel in the process I was rather relieved that all the dishes turned out fine. Sitting down with a glass of wine that someone pushed into my hand I was able to relax and enjoy the company. I really liked the cookbook in terms of variety of recipes and the different ways that Owen substituted ingredients in a way that was rather effective e.g. macadamia nuts for candle nuts and so on. One thing that I found rather frustrating was that the book was written in a way that it expected its reader to read from beginning to end. I can see why this was the case, aside from being a cookbook it provided an interesting narrative on Owen’s own life as an Indonesian who married a British ex pat before settling in the UK so some sort of chronological order was necessary. What I didn’t like was the way variations of recipes only mentioned that they were derived from without referencing page numbers. There were a few times that there was a spread with photos, but no recipe as the sauce or paste came from a previous dish several chapters back. Another thing I wasn’t so sure about the book was that it was rather conservative in the way it used spices. I find myself adding more salt, playing around with soy sauce and other condiments as it would have been a little too bland otherwise. Other than that, it really was a comprehensive recipe book and a great addition to my little library. What a feast! I love fish cooked that way. My mom stuffs hers with sambal and grills it, sometimes wrapped in banana leaves – heavenly. Interesting, what you said about the book. The negative things you pointed out, might irritate me. Do you think I should get it? If you don’t already have a reliable Indonesian cookbook then yes, it covers a lot of grounds and is a good reference point. To be honest I can get over most of the bits that irritated me and will definitely use it again.